I’m very pleased to be sharing with all of you a new blog series I’m launching today! With so much going on in Perth and so many stores, events and more, I’m starting a new blog series featuring these fabulous things in my series Vintage Perth! I hope over time to collect information, take photos, and review local stores and regular events within Perth to create a vintage directory which I hope will be useful to those within our fabulous city and also those visiting. RockaBilly’s adorably atomic open sign! Yesterday I visited a fabulous local store called Rocka Billy’s Retro (formerly known at Rockafella’s Retro) located on beaufort street in Mount Lawley. This store has been a hub for all things vintage for quite some time now but has had a big makeover since Sian and her husband took over the store. I must say I do adore this store, it’s one I’ve been frequenting for a long time and bought many amazing pieces for my home and work here including our vintage dining suite in our kitchen. I think something that makes Rocka Billy’s unique is that there are several rooms which you can browse and each of these has a theme. Prior to the new owner’s management I must admit the store was a little overcrowded and messy, it was very overwhelming upon entering and it would take some time to go through all that they had, but since the makeover Rocka Billy’s is looking astounding! A lot of renovations to the exterior have been made to give it a really authentic look, and the inside is very well organised with each item having it’s place and often even arranged in colour coordination! When you’re in Rocka Billy’s you can feel the love and warmth that Sian and her husband have given the store. As you enter the store your greeted by a fabulous window display which at the moment has a marvellous mid-century feel, you walk into the first section which on your left has fabulous kitchen and house items, and to the right a collection of antique radios and records, through the middle you have bars, and tables coupled with matching items which is just adorable. Upon passing an atomic counter with lava lamps and other items the next room is filled with pop culture and fashion with retro games machines, and comic book characters which follow you to the next room which is kitchen themed with a vintage kitchenette, canisters, aprons and so much more! There is also a back room which is another store, Strummers which is a music and record store with so many incredible instruments and also the most beautiful cash register which I regret not taking a photo of! I had a lovely time looking around the store to see all the new fabulous things, but also chatting to Sian who is an incredibly beautiful woman both inside and out with a true sense of community. While talking to her I knew just how passionately she felt for all things vintage. Another wonderful part to Rocka Billy’s is that it’s a family business that she runs with her husband and baby boy, Billy. Sian was also kind enough to answer some question I put together so you can get to know her and her store! Sian is the glamorous owner of Rocka Billy’s Retro with her husband Shaun, tell us a little more about yourself and what got you interested in vintage? I studied fashion and Visual Arts at Edith Cowan, I think it was an interest in war time aesthetic that originally sparked my interest in vintage. Spending time studying trends and style and playing with my own personal style – I think is what grew my fixation with vintage and retro. Do you have a favourite era or vintage style? Im so drawn to that mid-century, cocktail culture aesthetic and atomic retro style. Rocka-Billy’s recently has undergone a lot of changes including being renamed, what were you inspirations behind this? We had wanted to make a change to the name since first taking over the store (Rockafella’s Retro) but with falling pregnant with little Billy it just became such a huge task that we put it off until after he was born. Then his name became the inspiration for the store name. We didn’t want to make a drastic change but we definitely wanted to make it our own and bring attention to the store being under new ownership. It must be hard to not take every beautiful item home, do you have a special piece you’ve taken home for your own private collection? I have recently taken home some 1950’s beehive spice canisters and a cake tin that matches my canister set at home, so excited to find them. I also recently purchased a print of Tretchikoff’s Blue Lady from Lizzy Lizz Collectables for my kitchen. She was a must have. It’s obvious I love Rocka Billy’s, what do you think makes it such a special place? I receive a lot of nice remarks on a daily basis about how the shop being such a warm trigger of old memories for everyone that comes through. Whether they remember owning and item brand new or they fondly remember their parents or grandparents owning an item. I personally was taken hurtling back to childhood after opening up a Samsonite make up case and the smell of the case reminded me of my nanas make up box I would play in as a child. Rocka Billy’s is one fabulous vintage store that I highly recommend you visit next time you go vintage shopping! This store is your one stop retro shop with everything from bric bra to large vintage furniture; from makeup cases to records. Whether starting your collection or looking for something to complete your collection Sian will welcome you warmly into her store and help you with all your mid-century needs! If you’d like your store featured in my Vintage Perth Directory please email contact@ladylace.com.au! 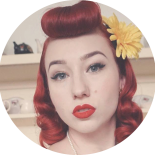 This entry was posted on May 19, 2016 by Miss Lady Lace in Pinup, Vintage Perth Directory and tagged 1940's, 1950's, 2016, australia, blog, blogger, glamour, Lady Lace, miss lady lace, miss lady laces pinup blog, nicole, perth, perth burlesque, perth pinup, perth pinup blog, perth pinup community, perth vintage, Perth Vintage Directory, pin up, pinup, pinup blog, pinup blogger, pinup fashion, pinup girl, pinup life, pinup lifestyle, pinup perth, red lips, retro blog, retro girl, retro glamour, rocka billy's retro, rockabilly, rockabilly's retro, the perth pinup community, victory rolls, vintage, vintage blog, vintage blogger, vintage fashion, vintage girl, vintage glamour, vintage perth, Vintage Perth Directory, vintage pinup blog.